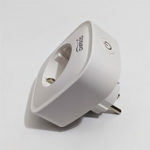 The DrayTek VigorAP 920RP is one of the three newly released access points from the 920R series especially designed to be suitable for outdoors conditions, focusing towards offering a reliable connection even in a more challenging environment (protection against extreme temperature) and maintaining a decent coverage despite some interferences. 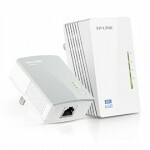 Furthermore, while the PoE support is a nice thing to have on indoors-type equipment, outdoors, it becomes mandatory, ensuring an easier deployment which doesn’t require having multiple cables running to your access point and negates the need for an electrician to help you with the installation (instead, simply use a shielded CAT cable). 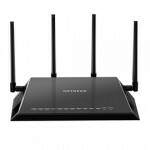 But, besides the rugged element, the 920RP has also implemented the MU-MIMO technology (supports two clients) and it can be adopted inside a centralised management software (called VigorACS) which means that it can be monitored and configured alongside other APs and routers, so, considering that DrayTek did well with its dual-WAN routers series, let’s see how does the VigorAP 920RP fare against its competitors. Note: Besides the DrayTek VigorAP 920RP, the 920R series includes the VigorAP 920RPD, which has both a PoE Out port (for connecting additional compatible devices) and a patch antenna and the VigorAP 920R which is the base model and lacks the second PoE port and the patch antenna. 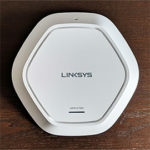 The indoor access point (consumer or SMB-suitable) is usually made of plastic, has a neutral design to easily blend in with the rest of the furniture (generally, gets mounted on the ceiling) and lacks any exterior antennas. 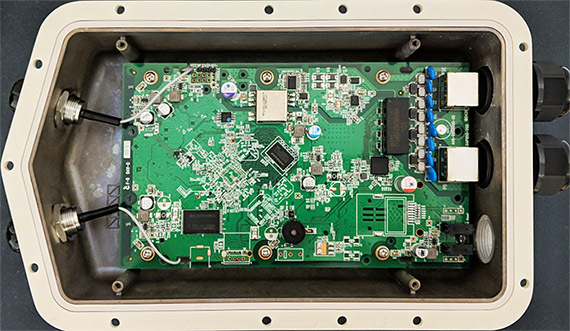 Some of these devices have been adapted to withstand outdoor conditions, such as the case of the Open Mesh A60 (and its successor, the A61) which has protective silicone layers all around the case to make sure that water and dust won’t be able to compromise the internal hardware, but the dedicated outdoors wireless access points are even more rugged, have a better protection against harsh weather and the ones that can reach really far do come with external upgradeable antennas. 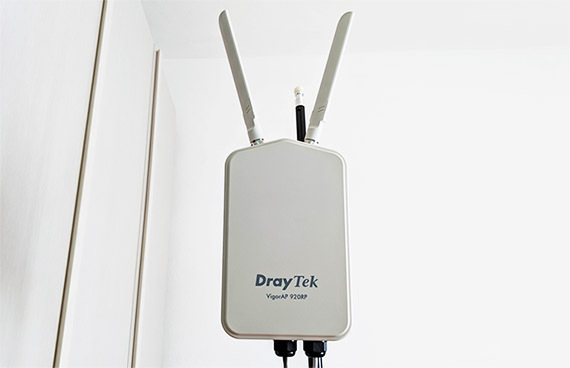 The DrayTek VigorAP 920RP falls into the latter category, featuring a rectangular case made of a metallic alloy (on the back) and plastic on the front, covered by a white matte finish and with two antennas pointing upwards (a bit to the sides because of the particular top surface). The front is completely flat, with only the logo and product name printed to break the monotony, while the rear surface is covered with prominent fins to help with heat dissipation. After removing the device form the box, I could feel that it has a bit of weight to it (it weighs 2.42 lbs) and its width is significantly larger than on its indoors equivalent (it measures 10.0 x 6.3 x 3.1 inches), but that’s to be expected from an access point that has to be rugged enough to withstand harsh outdoor conditions. Speaking of which, the DrayTek VigorAP 920RP is IP67-certified, so it is both dust and water resistant and, as seen from the test report, the access point survived in dusty environments (8 hours in a chamber with talcum powder), it did great while submerged under water down to 3 feet for 30 minutes and, as a bonus, it was also tested with the 1 mm Test Wire Probe to verify its level of protection against any attempted access to internal hazardous parts. Furthermore, the device will remain operational when the temperature ranges between -40 to 158° Fahrenheit (-40 to 70°C) and when the humidity is within 5 and 95% (non-condensing). This means that it will do fine during cold winters or really hot summers and it will survive the occasional heavy rain. 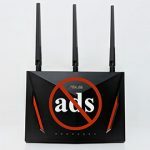 But, while the device will remain safe in most cases, the number one enemy is the lightning which can easily fry the access point when it is mounted on a pole (something that you have to worry less with indoor APs). 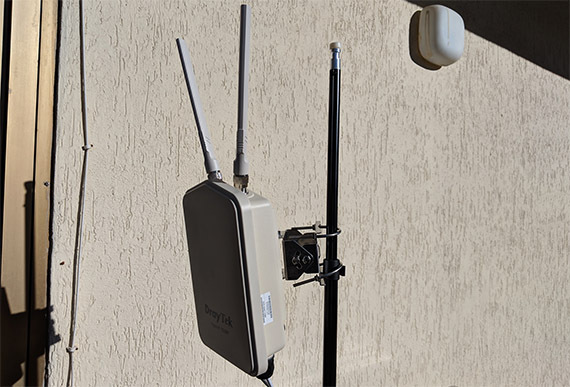 Thankfully, DrayTek has added an easy way to ground the device by connecting the provided ground cable to the designated area on the rear side of the AP and to a ground rod. But, since there is no lightning-proof system, it’s best to take additional precautions, such as a dedicated lightning-rod or lightning surge arrestors to protect the device in case the antennas get hit by lightning. 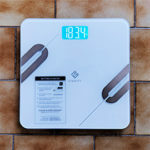 The VigorAP 920RP also features a couple of built-in sensors which can be accessed from the UI and will display a live graph of the temperature and humidity inside the case. 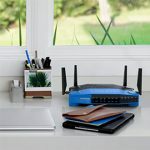 Most consumer-type wireless access points focus a lot more towards the design and may neglect the necessity of a proper heat management. 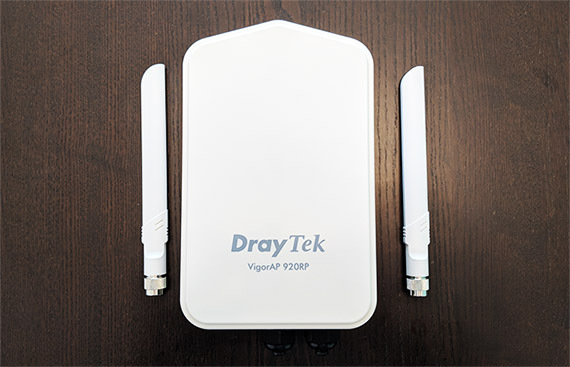 Considering that the VigorAP 920RP is an outdoor AP, it naturally lacks any ventilation holes or grills, but DrayTek has take advantage of the zinc (?) alloy and the rear-positioned fins to ensure that the device won’t overheat and, so far, the access point barely got warm (so, the system is very effective – I’ve also seen it implemented on the Zyxel NWA1123-AC HD and the results were just as good). 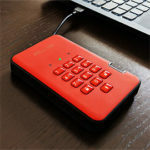 On the bottom of the device there are three large openings, two covered by thick black covers and the third is flatter and made of transparent plastic, exposing six LEDs and a small Reset button (press and hold it for 10 seconds to return the device to factory default settings). 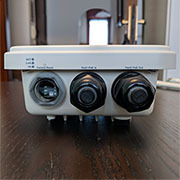 In the middle, under the larger cover, rests a PoE In RJ45 Ethernet Gigabit port which is used to connect the device to a power source (PoE switch or adapter) and for Internet connection, while under the second cover, there’s a second Ethernet Gigabit port, but which is labelled PoE Out and is responsible for connecting an additional device and/or supplying power to it (most likely a PoE camera that can be mounted on the same pole – the maximum output power cannot exceed 30 watts). 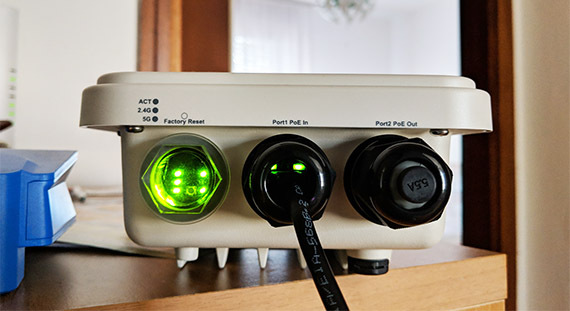 The six aforementioned small LED indicators are paired into two groups, each group for one Ethernet port: the first LED is for ACTivity (flashing green means that the system is ready) and two other for 2.4G and 5G (solid green indicates that the WiFi is ready and flashing green indicates that data is being sent/received). The LED array will be useful when you configure the device, but a lot less after you’ve deployed it, especially if positioned at a high altitude. After opening the case, I noticed that the device is equipped with a Qualcomm Atheros IPQIPQ4029 SoC, 256 MB Winbond W632GU6MB12I DDR3L RAM, 128 MB TOSHIBA XH6871 TC58NVGOS3ETAOO NAND memory / 4MB MXIC MX 25L3206E SPI Flash, a Qualcomm Atheros QCA8072 1VV PU7139HF U071300 switch chip and a TPS23754 74TG4 IEEE 802.3at PoE controller. 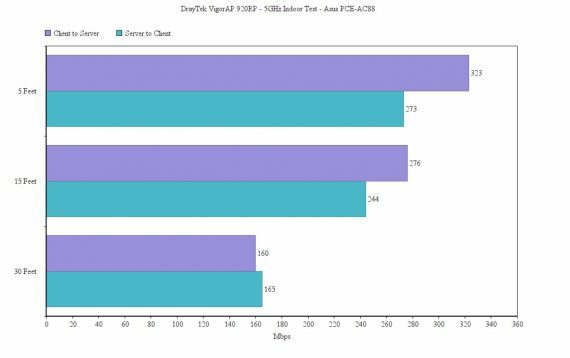 The maximum theoretical data transfer rate of the DrayTek VigorAP 920RP on the 2.4GHz band is 400Mbps and the maximum theoretical data transfer rate on the 5GHz radio band is 867 Mbps, which makes the device an AC1300-class wireless access point. 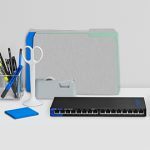 The hardware installation requires for you to prepare an Ethernet cable (preferably, shielded CAT), remove the cover from the first LAN port (PoE In) and connect one end of the cable to the Ethernet port and the other to either a PoE adapter or a PoE switch. To ensure the integrity of the device, make sure to add every part of the cover to the cable (washer, body, seal, clamping claw and the sealing nut) and tightly screw them into place. 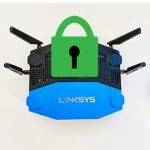 If you intend to connect any additional device (such as an IP camera), then you’ll have to go through the same process. 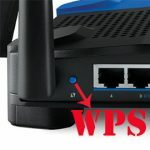 To power up the device, if you connected the access point to a PoE adapter, then, attach another cable to the free Ethernet port and to a router or go through a switch; in order to access the interface and configure the device you can either connect wirelessly to the network or use the second PoE port to connect to a computer. 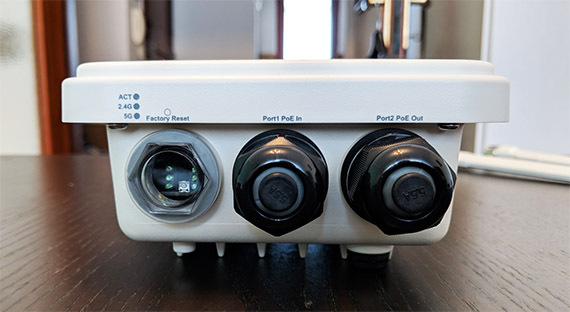 On the next step, find the best spot for your AP and take the mounting kit from the box: you will notice that it is composed out of two parts – de-attach them by removing the four screws (two up and two down) and connect the mounting plate to the back of the DrayTek VigorAP 920RP and the rest of the mounting kit to the pole using the two provided U-bolt screws. Afterwards, you need to reattach the two parts together using the four screws and, to ensure the protection of the device, take the grounding cable and connect it to a grounding rod. In order to test the wireless performance of the VigorAP 920RP, I took two computers, one is a laptop which will act as the server and the other is a desktop equipped with an Asus PCE-AC88 wireless card, which will act as the client. The first set of tests were done indoors, at various spots inside the house so, while being connected to the 5GHz network, from the client to server, I measured an average of 323 Mbps at about 5 feet away from the AP, while at 15 feet, the speed went down to 276 Mbps; at 30 feet, I managed to measure an average of 160 Mbps. From the server to the client, at 5 feet, I measured an average of 273 Mbps, while at 15 feet, I measured around 244 Mbps and at 30 feet, the speed was quite similar to what I got from the client to server at 165 Mbps. As can be seen, I did not see anything spectacular, but I am impressed by the speed consistency to and from the server. On the 2.4GHz network, things stand really good and I managed to measure an average of 203 Mbps at 5 feet from the client to the server, while at 15 feet, the speed went only slightly down to 198 Mbps; at 30 feet, I measured an average of 171 Mbps. From the server to the client, I measured around 158 Mbps and once again, the speed remained very consistent and I measured 157 Mbps at 15 feet; at 30 feet, I got no more than 135 Mbps. To test the VigorAP 920RP outdoors, I switched the two computers (the laptop became the client – I was not about to go with my desktop PC and UPS around my neighbourhood) and I took the laptop with me in order to see what’s the maximum distance to which I could still see some amount of throughput between the two computers (I also got lucky since the trees just lost their leaves). So, standing in front of the access point, at about 70 feet (L1), I measured an average of 76 Mbps (-65dBm) on the 5GHz network and an average of 105 Mbps (-56dBm) on the 2.4GHz network. The next location (L2) was a bit to the left, at 350 feet, I measured around 38.8 Mbps (-70dBm) on the 5GHz network and 44.8 Mbps (-61db) on the 2.4G network. 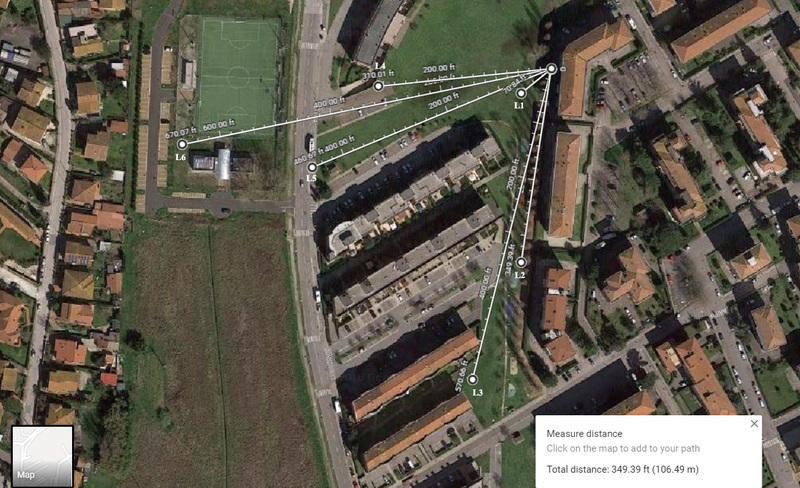 The third location (L3) is further to the left, at 570 feet and here things got a bit more difficult (and I experienced some disconnections): using the 5G network, I measured an average of 6.69 Mbps (-82dBm) and, using the 2.4G network, I measured around 6.10 Mbps (-80dBm). The fourth location (L4) is straight ahead, at around 310 feet and on the 5G, I measured an average of 24.2 Mbps (-73db), while on the 2.4G network, I measured around 46.1 Mbps (-68dBm). The fifth location (L5) is also directly in front of the device, at about 460 feet and, on the 5GHz network, I measured 8.95 Mbps (-77dBm), while on the 2.4G network, I measured 27.0 Mbps (-74dBm). Obviously, this is the maximum distance for the 5GHz signal, so I went to the sixth location (L6) only with the 2.4GHz network and I measured an average of 7.55 Mbps at 650 feet.